P.J. Berri is my adopted son (okay it's a teddy bear). I adopted him for Christmas, and with that there were some conditions: P.J. wouldn't leave without his group of friends. So me and the gang took them in as well. And boy are they a motley crew. P.J. used to be a DJ at a record store as well as a sales bear. He loves peanut-butter and jelly sandwiches, chocolate milk, soda pop, chilling and relaxing to his favorite tunes. His favorite color is brown. His favorite food is donuts. Likes sleeping, he dislikes waking up early. We'll get along just fine! 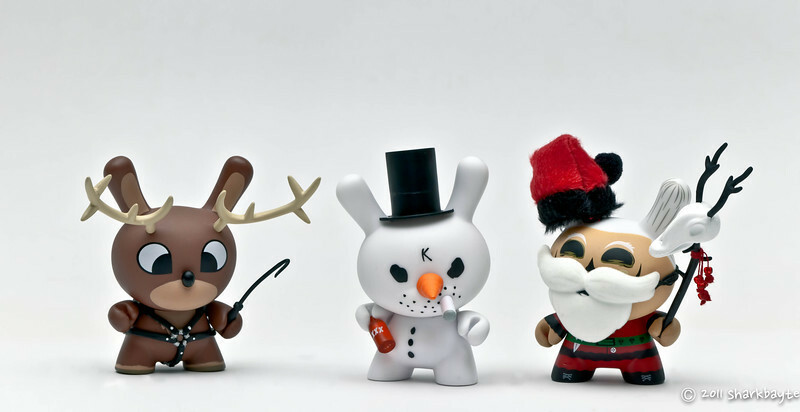 Chuckboy the naughty reindeer, Crusty the snowman and Saner Burgler is playing Santa. This should be interesting.